all of which were black & obviously superb at going unseen. it also looks quite fat. The other is still black although (as in previous years for them both) when the sun is shining on them you can see gold 'highlights'....but only in that certain light. Is this a normal thing, is it like a human going grey or may the fish be ill? It looks quite happy, not swimming strangely or anything. I would be most grateful if you could offer me an explanation or advice if you think it's necessary. 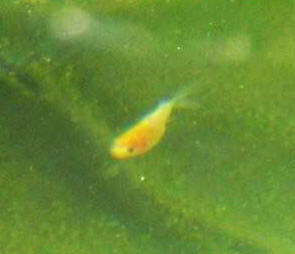 I have a very small (about 1") goldfish fry in my pond. It is probably around 1 month old. It has a very odd color to it. On some internet sites they say Shubunkins and fancy goldfish can get their colors in before other types of goldfish. There was a Shubunkin adult in my pond along with my comet goldfish. Could this one be obtaining calico coloring? Or is this just a normal part of goldfish development. Some photos of the fish in question are provided below. 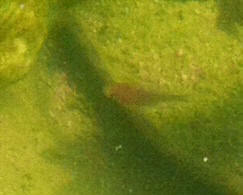 Here is my 1st photo of the fish. Here is another photo of it a few days later. Do you recall me writing in and asking if my smallest fish was a calico? Picture below. It is the one in the lower right corner. The larger if the two fish is the little one's big brother. you count it's long flowing tail. I live in the Arizona desert. Should I rear the little fish indoors this winter, or will it do ok with the other fish in the pond? Thank you.